This may seem premature, but I am opening this thread so that city planning (which we have talked about off and on for years) of Sutch can commence so that we can avoid the issues we see with Anvil. I think we can all come to a consensus on the general style as well as the function of the city before we get to the actual world-building. The goal here is not to completely design the city, but rather to provide some guidelines for the eventual modder. There MUST be room for the modder to be creative while also having a general plan to follow in regard to style. One thing I think that will help here is to decide exactly what sort of city Sutch will be. We have had a backstory in the past that dealt with the reason Sutch does not appear in Oblivion. The story involved Sutch being transferred to Hammerfell in some sort of governmental wrangling. This does not have to be what we go with, but does provide some background on what the thoughts had been about the location. We really have a chance to get creative here in both the style of the city and in the story we want to tell. This can be a Hammerfellian city or it can be another clearly Colovian settlement. Obviously going a colovian route would be easier when we think of the resources required, but I think we can pull something together either way. I would love to hear everyone's thoughts on this basic item first and then we can expand from there. I still like ZackG's basic idea for Sutch, though perhaps adjusted to make up for the fact that Morrowind doesn't really "do" cliffs. I imagine the city being set up carved into rock along two facing cliffsides that are separated by a river. The river comes in from the north from the lake, curves towards the west as it makes it way south, and then curves back east at the end of the city before it breaks west again and drains from the coast. The two cliffsides are connected by large arched bridges for the top levels and cheap wood and rope bridges for the bottom. The cliffside on the left is nearly pure Hammerfellian. Not in architecture, but in decor and people. The people on the right are mixed between Imperial and Hammerfellian and they mix quite well despite the crime that grips the city. At the top level of the Imperial side sits an Imperial monastery. A once beautiful building, it now sits mostly empty and rundown. The Imperial guard has been so run thin that an Imperial in fear of the Kali Mes cant even find sanctuary from them in the monastery, as they Kali Mes will just walk right in and kill them there on the spot. As you can see, it still has a tiered structure to it, but it's less dramatic than the cliff faces of some of ZackG's work and is more in keeping with the limitations of the MW engine. The highlight of the city is a massive overpass bridge which I'm tentatively calling the Great Span, a highway for commerce and travel between Hammerfell and Cyrodiil. The Kali Mes conflict largely focuses on control of the Span. The Great Span serves as the market district of the city, lined with market stalls and vendors. Aside from the Great Span, the city is divided into roughly three quarters: the West Bank, which is native Hammerfell and includes the Temple of Kynareth, housed in a monastery originally devoted to Tava but appropriated by the Imperials when they took control of Sutch (this being one of the primary grievances of the Kali Mes); the East Bank, which is upperclass Colovian and is the seat of Castle Sutch and the guilds; and finally, the Mud Flats, tightly packed slums built along both shores of the river, living in the shadow of the Great Span. This is where you'll find the usual fare of fishermen, brothels, etc. EDIT: Also, please ignore the specific placement of houses, walls, etc. in the concept. I didn't put a whole lot/any effort into that side of things. TR did some very nice things with cliffside cities, I don't think we should discount the idea entirely. I'm more worried about the implementation into the wider landscape: for this city's location and importance to make sense requires a rather dramatic canyon across the northern Gold Coast, and an absence of easier trade routes or settlement locations. I'm also not really down with either implementation of the religious building or the conflict: ZackG's version strikes me as odd due to the apparent superiority of the Redguard rebels over the Imperial Legion and Cult, in the Imperial Province: if anything, I would expect the Legion to be pushing the Redguards back. With the temple, I find it odd that one of the nine most prominent and lavishly funded religious orders in the land are squatting in a building they took from someone else a couple of hundred years ago, and that they can't even defend properly. An alternate proposal: the Order of Kynareth has its own monastery, but it is one the outskirts of the Imperial side, and was founded on the ruins of a shrine to Tava (keeping the grievance). In the center of the Redguard district stands a pilgrimage site dedicated to the Ansei, the Redguard's sword saints, commemorating the southernmost point of the Warrior Wave. In terms of architectural and city-building ideas, we should definitely look through TR's Hammerfell Artbook. Some prime material right there. 1E 808: the Redguard arrive on the shores of future Hammerfell after fleeing their own, sinking continent of Yokuda. At the time, the desolate wastes of Hammerfell were only home to small cities and wandering tribes of Orcs and Nedes, raiding the borders of Cyrodiil and in turn being preyed upon by Nordic and Imperial raiders. The ruthless Warrior Wave (Ra Gada) slaughter and displace these peoples, and continue to conquer most of their current lands. In but a few years, they have expanded far into the Gold Coast, before turning around and consolidating their borders. 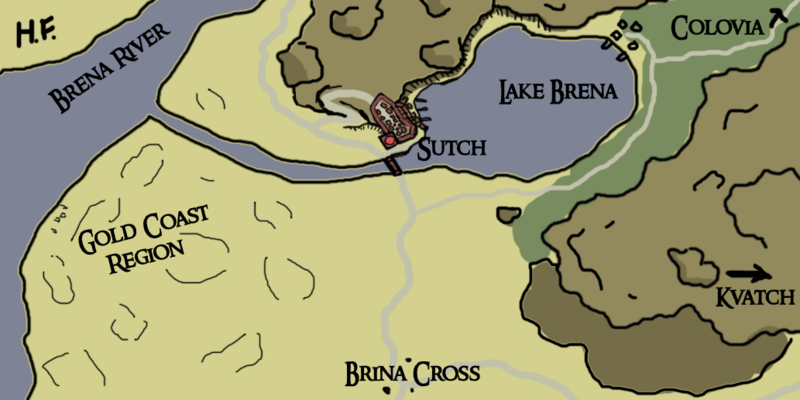 On the edge of their territory, the southernmost point the Ra Gada ever held, they found the outpost known as Sutch. All Colovian settlements, as well as the Ayleid enclaves on the coast, are wiped away by the Redguard. 1E 810-1E 980: relations between Sutch and its Colovian neighbors are understandably strained. Several of the Shore-Kings, the then-rulers of the Gold Coast, attempt to reclaim the northern part of their kingdom, but have to desist due to increasing aggression from other sides - Bosmer, Sload, and the predatory behavior of the inland Colovian kingdoms. The Redguard, meanwhile, are entirely unwilling to trade or communicate with their new neighbors, as they consider the peoples of Tamriel weak and beneath their dignity. 1E 980: Redguard cooperate with several Tamrielic races in the Siege of Orsinium. Afterwards, they are more convinced of the worth of these peoples, and ease up: trade and cultural exchange begins between Hammerfell, the Alessian Empire and the Colovian Estates. Kvatch and the other Colovian cities are very keen to trade with Sutch, as doing so circumvents the substantial tarrifs and tolls that Anvil extorts from all trade on the Gold Coast. 1E 2703: Reman I ascends the throne, and begins an aggressive policy of conquest across Cyrodiil. Sutch is retaken by the Empire, and added to the lands of the King of Anvil, who was at the time a very loyal vassal to the Empire. A period of heavy Imperialization follows, in which most signs of Redguard culture are effaced. 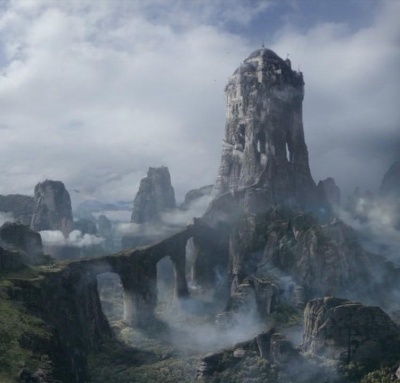 2E 540: a Redguard religious order reclaims Sutch. The last King of Anvil had died some time before, and the county was governed by an Imperial Magistrate answering to the Akaviri Potentate. He, in turn, was too weak politically to retake the city. Sutch remains in Redguard hands,though by this point the original population has mingled heavily with the Colovians. 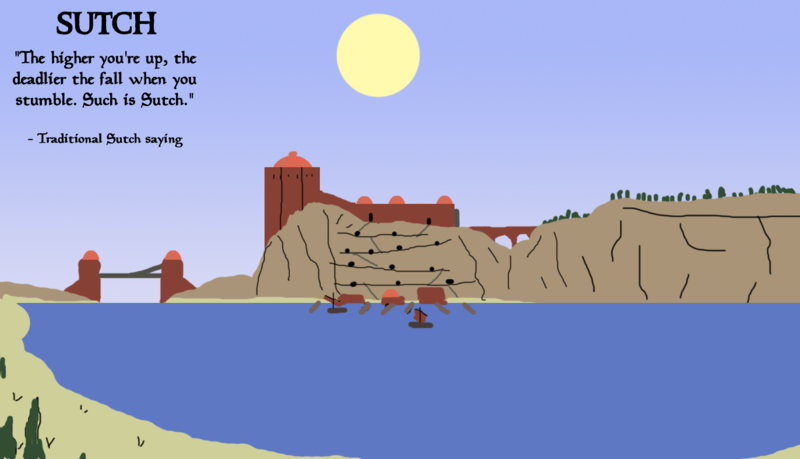 2E 862: Tiber Septim conquers Hammerfell, and adds it to his new Empire. Sutch is briefly a part of the Gold Coast again, but the after the rebellion and subsequent Treaty of Stros M'Kai, the city is once again added to Hammerfell as an "associated region", whose status was to be reviewed on a later date. 3E 267: the Camoran Usurper is defeated, after a decade of bloody terror. Sutch was sacked by his undead legions, and its leaders were either dead or far to the north, as part of the Redguard forces. In the absence of native leadership, the city was claimed by Commodore Fasil Umbranox, sent by the Emperor to quell piracy and unrest on the Gold Coast, and later added to his lands after he was made the Count of Anvil. Infragris wrote: TR did some very nice things with cliffside cities, I don't think we should discount the idea entirely. I'm more worried about the implementation into the wider landscape: for this city's location and importance to make sense requires a rather dramatic canyon across the northern Gold Coast, and an absence of easier trade routes or settlement locations. Maybe put the city on a cliff outlook? In that way we can have a cliffside building, but we'll miss out on the bridge war concept. The plateau area is where the great market is, the merchants and the rich people. Lots of taverns for travellers. The castle on the cliff outlook is very defendable and keeps an eye on travel to Hammerfell, there is a great desert-like area of plains beneath the cliffs. On the cliffside lives the poor and commoners. I forgot the river, but it could run by the feet of the cliff, with a bridge beneath the castle. The cliffside should extend both North and South making this the preferred trade route. Last edited by roerich on 19 Aug 2014, 21:07, edited 1 time in total. That concept looks very nice roerich! Regarding the Kali Mes, I don't know entirely what to do with them. If we make them a native crime syndicate as has been discussed previously, then they're just the Camonna Tong wearing turbans, but I also don't want to turn them into the Renrija Krin either. Adding a cult element fixated on the Ansei as the source of their resentment against the Imperials would be a good way to differentiate them from both. The Yakuza might be a good source of inspiration here as far as their codes of conduct and rituals are concerned. EDIT: Ninja'd by roerich. I like the general idea of this one as well and it's dead-on as far as how the architecture should look. I don't love the idea of putting it right against the border because, again, we'd have to landscape a decent portion of Hammerfell as well so the city's not overlooking a barren wasteland of heightmaps, or else an immersion-breaking infinite river with no other side in sight. In general, my feeling is that we should probably call as little attention to the Hammerfell border as we can, since there's no Hammerfell project at present that we can coordinate with, as we eventually will for the Skyrim and Morrowind border regions. Perhaps my concept could be overlooking the Northern half of the smaller river from the lake? I will post a revised concept sometime tomorrow. Sounds good. Glad we have somebody who can actually draw city layouts/architecture, I'm absolutely useless at such things haha. I think a river (preferably a tributary to the Brena) should definitely play with the layout of the city. Having it hanging on the cliff is cool, but I think we already have Kvatch to fill that role, so to speak. Since the Colovian Highlands are directly east, maybe the cliffs or canyons Sutch is on could be the border between CH and GC, that way it isn't just a random canyon in the middle of the GC. The plateau/mesas are the last stretch of the Colovian highlands, and Sutch is located on the edge itself, overlooking the river running to Brena and the Gold Coast. Trade from Colovia comes from the Gold Road or the Brena Lake valley to the East. In the cove is the harbour, and the city follows the same plan as earlier, even if modified somewhat - rich, small fortress-city on top, and a sprawling network of cliffside buildings from the fortress to the harbour (I will illustrate further). Some inspiration from pic no. 12 in the HF artbook could do. @MoonAndStar: I'm not up to date on Kvatch plans, but from what I've read, I've mostly associated it with The Eyrie from Game of Thrones: http://awoiaf.westeros.org/images/thumb ... _Eyrie.jpg Thouh more Colovian in nature, basically a big block of a city carved out on top of a mountain in contrast of a cliffside fortress. Completely impenetrable of course. I think we should use our possibilities to create some kickass cliffy castle-cities in Colovia. I don't think a lake would work like that, geographically speaking - you need to have tributaries running towards the lake, not only away, or the whole thing would dry up. A branch coming from the Brena river to the lake would fix this (running through a narrow ravine, perhaps, so that it is useless for traffic). Other than that, I really like your map, roerich: the high plateau to the north would hide the vast expanse of nothingness of Hammerfell. About Hammerfell: I know we are opposed to wasting time and resources on an area beyond the province, but that side of the map would literally just be desert. Since there's no province mod for Hammerfell, it would not be a bad call to just have a buffer of undetailed landscape, if only to indicate that the Brena River is, in fact, a river. About the city: it's a little smaller now, which is good, and with this plan we avoid a symmetrical split (we should avoid comparison to SHotN's Karthwasten, also a twin Nord-Redguard city). We can still use the previous concepts: the cliff-fortress is obviously the "upper" Imperial part of town, and we can merge to Redguard half into the slums at the foot of the hill: it's much more fitting for the Kali Mes to be operating in such an environment, anyway. The Great Span, in this plan, is not a bridge but rather a broad switchback path that connects the top of the cliff with the bottom. It keeps its function as a kind of long marketplace and the area which Imperials and Redguard fight over. 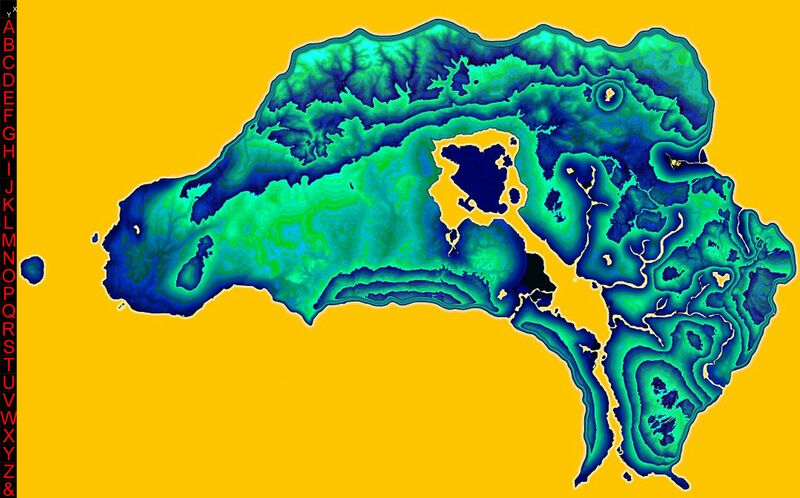 Here's the heightmap, for reference. The difference between Sutch and Kvatch should be that Kvatch is on a hilltop, and Sutch an a cliffside, which is very different. I like the concept of Roerinch but think it will be hard to make a harbour at the bottom of the high cliff that is connected to Sutch if the distance is to tight. If the cliffs raise straight from the waterlevel, there is not much room to make a road down to the harbour, simply because you need a certain distance to bridge the difference in height. There should be two roads to the top of the cliff, one going West around the cliff and a less steep road, and a switchback road going up from the harbour area. The switchback road should have all kinds of wares and cranes working transporting goods upwards. I like these plans a lot. We should probably figure out a better name for the lake though instead of the one I slapped down in 5 seconds, haha. Maybe Lake Fasil, in honor of the good Commodore? I'd like the local placenames to show some Yoku influence. How about lake Rataka? We could do both, like the River Malapi/Niben River situation with the Khajiit. Good way to show how highly the Colovians regard Yoku culture. I like that solution. Maybe Lake Rakatei/Fasil? - Name the fortress-palace "The Ruby" or "The Ruby Palace"
- The entire cliffside up the switchback is lined with cavern dwellings, houses cut out in the cliff etc. Lots of shops, illicit activities, poor homes, taverns, brothels.. Some caverns extend quite a bit into the cliff, lots of Kali Mes activity here. - Have a large walkway extend from the upper city gates, with a tower housing several cranes looming over the cliffside. I can try to make a concept. - The harbour is walled to the North and the South and has some warehouses and administrative buildings. - The population is about 40% Redguard, 30% Imperial, 30% Other. The upper, walled city is mostly run by wealthy Colovians and a few Redguard merchants, while poor Redguard, Khajiit, Bosmer etc. live on the cliffside, working transporting the goods up to the upper market, working the docks etc. - The cliffside fortress is 1. the palace on top, 2. upper fortifications with loads of arrowholes, 3. the lower area is mostly bricks but with a dungeon carved out as well. Instead of a path going up the cliff from the lake, we could have a fast travel service that uses a crane/lift to get you to the city and back down. I guess that will only work if the crane is placed right on a cell border.